Total due 22¢, manuscript 'Sh 22'. 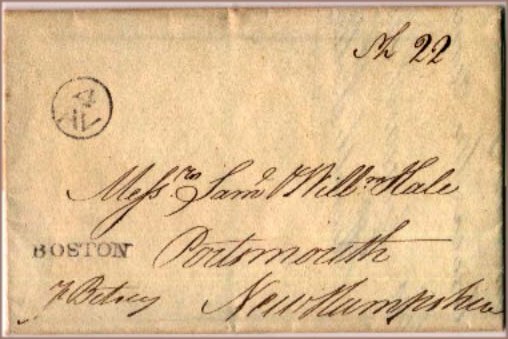 The US ship letter fee of 2¢ per letter plus inland postage applied from 2nd March 1799 to 31st January 1815. The inland rate applied from 17th April 1799 to 1st February 1815. 'BOSTON' straight line ship mark. US Bishopmark (Franklin Mark) '4/AV' (4th August).